Aunt Lena practically begged to be a M.O.M. and we just couldn’t say no! 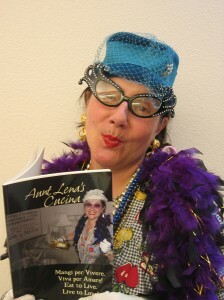 Aunt Lena is the alter ego and creation of Anne-Louise Sterry, an internationally known speaker and performing artist. Aunt Lena is the irrepressible, unpredictable, yet almost prescient distributor of “Cutting Edge Mediterranean Wisdom.” She is the crazy Italian aunt whose view of life, love, husbands and food does not just bring a smile to people’s faces but actually goes a little deeper into their lives to make a real and positive difference. In their performances, keynotes and workshops both Aunt Lena and Anne-Louise never fail to inspire and delight. Aunt Lena’s Cucina is on sale here at Mother’s Bistro and you can follow or book Aunt Lena and/or Anne-Louise at www.auntlenasez.com & www.anne-louise.com. Here I am ta share my recipes wid youse and some tips on how ta have a good life. It’s all connected youse know wad I mean? I got my book Aunt Lena’s Cucina; and lemme tell yas it’sa more than a joosta cook book. ‘Mangi per Vivere, Viva per Amare!’ Eat to live and live to love! Dat sez it all. I was born in da south part of Italy and den we came ta this country when I was a little bambina. Of course we came ta da east coast- New Joisey and New York. (Youse wanna know more about “La Famiglia” youse betta have me to ya place, ‘cause itsa long story!). But we grew up cooking all da tings they used ta cook back home. Youse learn to make-a dis food fa yerselves –simple and ya feel so good and so does ya family and friends. So eat up and enjoy my recipes or da ones from Chef Lisa cause boy is she one good cook, almost as good as me!